This arrived in my in-box today thanks to the folks at Bike EXIF. 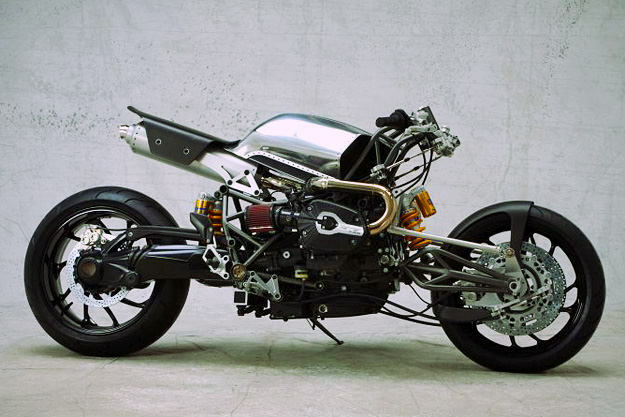 To be honest, I don’t know quite what to make of this… this… Well, it’s got two wheels so I guess it must be a motorcycle, a motorcycle designed to be the most mechanically complex and visually ugly two-wheeler possible. It’s only lacking a bleeding stag’s head perched over the front wheel to make it a true Viking nightmare. Perhaps it’s like opera. I can certainly appreciate the talent and skill that goes into the creation of one, and the years upon years of training and practice it takes to perform, but please don’t abuse my senses by making me listen to it. This motorcycle abuses my senses. To see some videos of its construction and unveiling, go to the Fastbike site. And while you’re there, enjoy the automated translation from Swedish. “See photos and films in the cool odd creation.” left me a bit confused. And “Sneak Titt in Egeland garage :-)” was frankly disappointing. But the comments are pretty funny, my favourite being, “Hahaaa, wonderful videosnutt. Almost as OCC solid with liberating self distance :-) As far as bums feel like the Transformers goes S & M!” And no, I have no clue what he meant by that. A 44-year-old motorcyclist died as a result of an Ottawa hit and run accident in the pre-dawn hours this morning. The driver of the car did not stop, and the police are now searching for what they believe is a gold or tan Buick Regal or Century. Okay, accidents happen, and we don’t yet know the details as to what actually transpired and who was at fault. But when the person that hit him left the scene, he or she was leaving a dying person on the ground, a person whose life may have been saved had someone offered immediate assistance and called an ambulance right away. According to some reports a pedestrian found the rider some time after the accident, lying about 20 feet from his crumpled bike. When that driver ran, this escalated from a hit and run to murder, in my opinion. I hope they get the sonofabitch responsible and he pays for a long, long time. How can anyone just leave a person to die? A 56-year old male has turned himself into police. His next court date is June 12. Stay tuned. You just gotta love those motivational posters! My beloved ‘74 Norton Commando had spent the last couple of years just sitting in the garage, an unfortunate consequence of too much work, too little time, and a series of back problems. Finally I came to the conclusion that as much as I loved the bike, I was past the stage where hours crouched in a cafe racer riding position sitting on a cement-hard seat was in any way to be considered fun. In fact it was pure misery. So my choices were either to polish her up and place her in a position of honour in the living room, or sell her. Plan A was immediately nixed by the spousal unit (very unreasonably, in my opinion) so it was on to Plan B. The local Norton Owners Club is a very active group, and there are always folks looking to add to their collections, so I wasn’t too worried about finding a good home for her. Within a few days I was approached by a new member. We did some negotiating, and a deal was struck. As she wasn’t plated, I agreed to trailer her to her new owner after he got off work at 9 P.M. one evening. So on the designated day I loaded her up and set off to the address provided. Which turned out to be a bank in one of the seedier parts of town. “This can’t be right,” I thought as I pulled up under a streetlight and the watchful gaze of a couple of hookers on the corner. As I was checking the address again the buyer came up to the truck’s window. Apparently he hadn’t quite got up the courage to tell his wife that he had bought another motorcycle, and needed a place to store it until he could break the news. So into the parking lot we went. And with the hookers looking on (they didn’t offer to help), we unloaded the bike and wheeled her in through the front doors of a closed bank, at 9:30 at night, after dark, past the teller’s counter, down the hall, and into the lunch room. I can only imagine what the staff thought when they came in the next day. Why no one called the cops, I’ll never know, as I was half expecting them to come racing up, guns drawn (and hopefully not blazing) at any time. But fifteen minutes later we were done, Black Beauty was delivered, the bank was closed up again, and I was on my way with a nice wad of cash in my pocket. I haven’t seen her since then, although I have it on good authority that he finally got up the nerve to tell his wife about her, and she’s now back on the road where she belongs, stretching her legs on the straights and swooping gracefully and effortlessly through the twisties. And I still miss her. It takes great personal courage to come out of the closet, especially in the motorcycling community, but I know there are other riders out there who golf. Do you find spending 5 or 6 hours away from your motorcycle is a problem? Is all that exercise reducing your carefully cultivated beer physique? Have you secretly yearned to wear plaid pants in public? Then this is for you. While this handy little electric bag cart will do absolutely nothing to improve your game, you will look very cool on the course. And with customizing options including colours, flaming golf ball logos, wheelie bars, and even cooler trailers to carry the beer for the entire foursome, you will certainly be the centre of attention. Throw in the plaid pants and fluorescent green golf shirt and you’ll be a standout for sure. Still not convinced? Check out this video of the Turf Chopper in action. Word on the street (at least on my street) is that there will soon be an accessory available that will make the “potato-potato-potato” sound, converting this from just another wanna-be chopper to the real deal. It may be too little too late for GM, but this latest announcement of a partnership with Segway to produce the Puma is the kind of creative thinking the Big Three should have been doing for years. Obviously this is not everyone’s idea of the ultimate two-wheeler, but for the right marketplace it has the potential to be a low-cost, energy efficient, flexible means of transportation. Unfortunately for North Americans, our governments will ensure that this innovative idea will never see the light of day in any of our over-crowded and motor vehicle congested cities. By the time they have legislated front and side airbags, impact bumpers, seat belts, crash guards, safety glass, crush-proof fenders, a dashboard full of idiot lights, strengthened door pillars, and a spare tire the Puma will be indistinguishable from this other GM product. Except that the Puma driver (rider?) will probably be required to wear a helmet. You want accuracy? Look out the window. What the weather forecaster called for: Chance of rain. +5C (41F). What we got: 4” of snow. –5C (23F). If you believe close enough is acceptable, and accuracy is overrated, then there’s a career waiting for you with the weather service. Needless to say no riding today, or tomorrow , and Thursday isn’t looking so hot at this point either. Back to tidying up the garage. The progression of technology in all things motorcycling has been pretty amazing and generally beneficial. We can ride harder than ever, stop faster than ever, be more comfortable than ever, and go longer distances without breakdown and/or major maintenance than ever. And while I know lots of folks with vintage iron (I’ve been known to lust after a few specimens myself) those bikes are usually ridden with a lot of care and a healthy respect for their limitations compared to today’s models. But at what point does all this technology just end up dumbing down the riding population? One example. A relative of mine who shall remain nameless to protect the guilty (but who’s first name starts with Bob) rides a fuel-injected Road King. Last year while on a trip to Australia he rented a Heritage Softail in Melbourne to ride the Great Ocean Road (one of the best riding roads in the world in my opinion). The rental agency advised him that the fuel gauge was broken, so he’d better keep an eye on distances between fill-ups. However that does no good if there aren’t gas stations every few miles – which is the case in Australia. Gas stations can be few and far between and so Bob found himself in the unfortunate position of having run out of gas in the hinterlands of Victoria, somewhere northwest of Melbourne. “Damn” he said, or words to that effect. The first farmhouse he walked to didn’t have any gas, but the person who answered the door allowed as how the next farm over usually had some on hand. So a bit further along the road he knocked on another door to be greeted by an older gent who said his son was out, but he might be able to find some gas. Off he went into the barn and returned with a battered old coffee can full of brownish stuff that smelled vaguely like gasoline. So Bob headed back to the bike with his open pail of gas, dumped it in the tank, fired it up, and rode off hoping he had enough to get to the next filling station - and that whatever was in the can wouldn’t blow anything up in the meantime. Sure enough a few miles later he found a gas station. And from then on made it a habit to fill up every chance he got. Now back in the 70s, we knew that! We’ve all had those moments when we do something that, too late, we realize probably wasn’t the smartest thing we’ve ever done. And to make it worse, it usually follows a shout out to the crowd to “Watch this!”. I expect this guy was having just one of those moments as the understanding dawned on him that he’d over-cooked the stoppie (or brakie – take your pick), ripped apart his front end, and was about to get very intimate with the pavement while wearing nothing but a t-shirt and doo-rag for protection. Would have been fun to watch though! Although this story involves four wheels and not two, it’s too good to pass up. Apparently this guy was too drunk to walk after consuming “at least” 15 beers at the local tavern, so instead decided to ride home on his motorized bar stool. Or maybe not, as he’s now saying that his head hurt so much after the crash that he went home and drank 1/2 a bottle of whisky before the cops showed up. Regardless of his state of intoxication, he crashed en route while trying to make a turn at about 20 mph, injuring himself and triggering a 911 call. Kile Wygle was charged with DUI and driving with a suspended license. The barstool was towed away and is now apparently in hiding.